As I sat in a state of pure bliss in a massaging chair at a local nail salon, I looked down the long line of happy, chattering women extending either a hand or foot to a nail technician and began to ponder: can you tell what type of person you are by the condition of your fingernails or toenails? 1. Do you keep your fingernails short or long? 2. Do you get manicures but not pedicures? 3. Do you get pedicures but not manicures? 4. Do you hate anyone handling your toes? 5. Do you get both manicures and pedicures? 6. Are you a DIYer? 1. A. If you keep your fingernails short, you're probably a smart, no-nonsense type and work with your hands. 2. If you get manicures but not pedicures, you (a) pay attention to detail, (b) have nails with no splitting or deep ridges that make nail polish a challenge to keep on, or get acrylic nails, and (c) you probably hate your toes so much you refuse to give them the time of day. Bad toes. Bad! 3. If you get pedicures but not manicures, me, too, and thus I really like you. Don't you adore those relaxing foot and calf massages? Want to grab a quick cup of coffee afterward? 4. If you hate anyone touching your toes, you're missing out on one of life's greatest mini-vacations. Get over it. Toes are ugly. Don't shun them. They can't help it. 5. 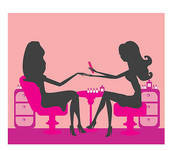 If you get dual mani/pedi treatments, you have more patience/time than I do, but good for you. Pat yourself on the back when those nails are dry. 6. If you're a DIYer, you clearly have artistic ability and/or are possibly ambidextrous. Well? Did I nail it? Lol this is fun Kate. I keep my nails short, mostly because they break anyway as I typ a lot each day. My nails are allergic to nailpolish, so they are bare. I do get a pedicure once in a while, even though I am extremely ticklish, it is bliss. And necessary. Just had my first pedicure recently and loved it! Why did I wait so long. Probably a combination of time and money but it was pure bliss like Aurian says. Never felt that way when I got my nails done so I will do it again and soon. My nails are short and I just do them myself. Bliss is the only word to describe it! I won't argue with that, Elaine! I have very hard nails..they grow like crazy.....so, when one finally breaks...could take a while..I mean, I work in the yard, handling bricks, dirt, wood, takes a lot to break a nail!!! Then I cut them all back short with a clipper. I use to LOVE to paint my nails......all the time...and sometimes I would splurge for a REAL manicure!!! But...the last few years...they just stay short now..when they grow out a bit, I clip them back.....no reason for long nails anymore...SOMEDAY, I would LOVE to have them painted again...if I am not too tired!! LOL!! As for toes....I never had a pedicure.....my nails are so hard.......I have to soak them even AFTER I soak in the tub..so I never bothered..use to paint them tho....back in the day........I think I would be happy with a manicure...and just a really good foot soak!!! Sue Ann, I never bothered with pedicures until just a few years ago, after a friend described a session to me. You get a wonderful foot soak before the tech works on your feet. And while that's happening, you also get a massage from the chair all down your back. It's heaven. The techs are used to dealing with all kinds of toenails, so don't worry that yours are too hard. Do I sound like an ad for a nail salon? Yikes. Oh my gosh! A back massage!!!? You can sound like a nail salon all you want! I want to go!!!!! LOL!! My poor feet need it..I am a sandal wearing, bare foot kind of gal,,and I work them so hard...use to be a dancer...and THAT was no easy beans on them either!!!! You got me thinking....after the garden is done.......right before winter...may treat myself.....if I did it now, I'd never want to get them dirty!! LOL!! I get a mani/pedi once a month thanks to a friend who gave them to me for Christmas. I had never had a pedicure until 2 years ago and I love them. I never even painted my toe nails when I was a teenagers. I keep my nails short as I do a lot of typing and crafting and long nails would get in the way. It is such a joy each month I can't believe how much I have missed all these years.